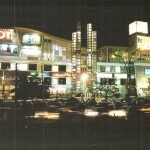 DLF Mega Mall is located in Phase-1, of the DLF City in Gurgaon. The Development has a total lettable area of approximately 290,000 square feet and houses a 3-screen multiplex and a 15,000 square feet food court by the name of Dt Dinners. In addition to the food court the mall also offers a range of dining options for customers. Tenants in this mega shopping complex include Fabindia, Golden Dragon, Reliance, Fashion Cube and Reebok, to name a few. You can check the list of Shops in DLF Mega Mall here before you decide to visit the place for shopping.